Many of your know this bear. I made him last summer to be included in my exhibition at Wave Hill in New York. No, he is not the 9th print. For one he is way too big, 24″ wide by 40″ tall and that might be too big for some people. Plus, he is more expensive $450 and that may be too expensive for some people. 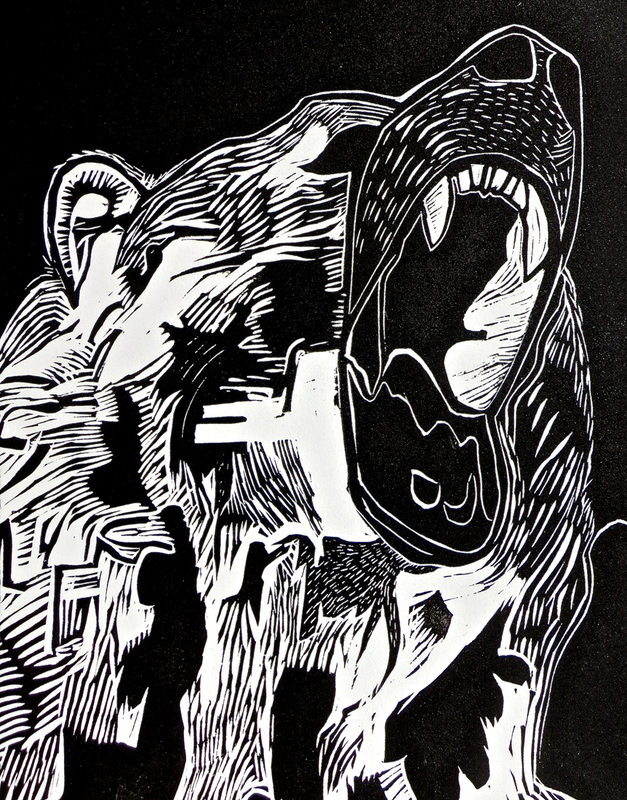 He is a bear, ha ha, to print, but he is stunning. Do not worry dedicated followers of 30 x 30 x $20 because you can get a piece of him today, and yes for $20 at my Etsy store. Print #9 of 30. Roar! Bear head. This print is called a “bleed print” because the image goes all the way to the edge of the paper, the full 10″ x 8″, there is no border. This is the first of at least 3 I will make into bleed prints. It gives a huge impact and Roar! is terrific print. 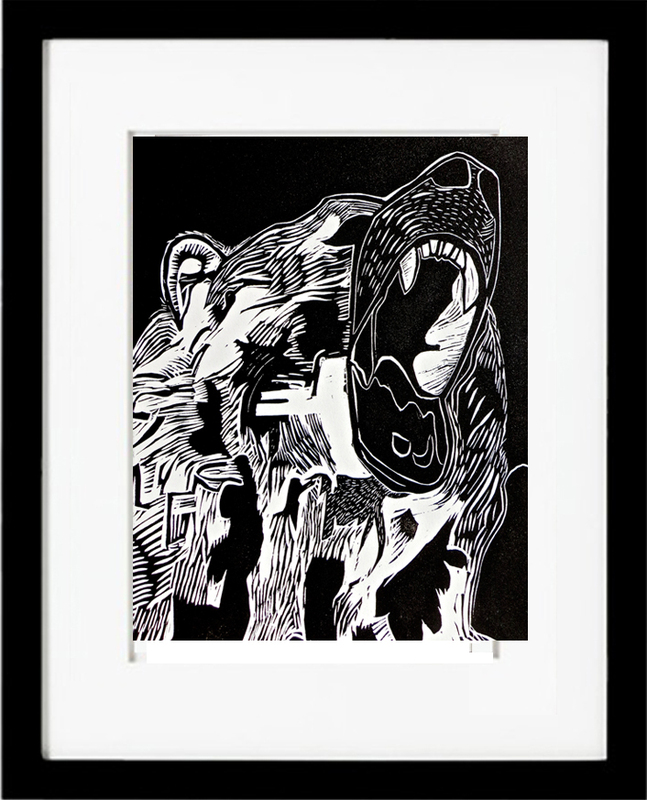 If you had it framed this is what it would look like with a 2.5″ mat around the bear head. 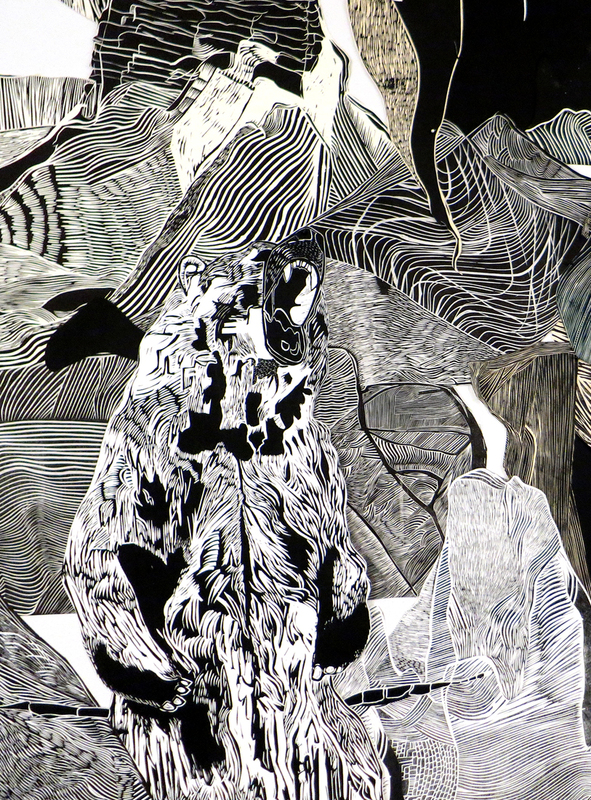 But the piece does not come framed or matted, it is only for reference. 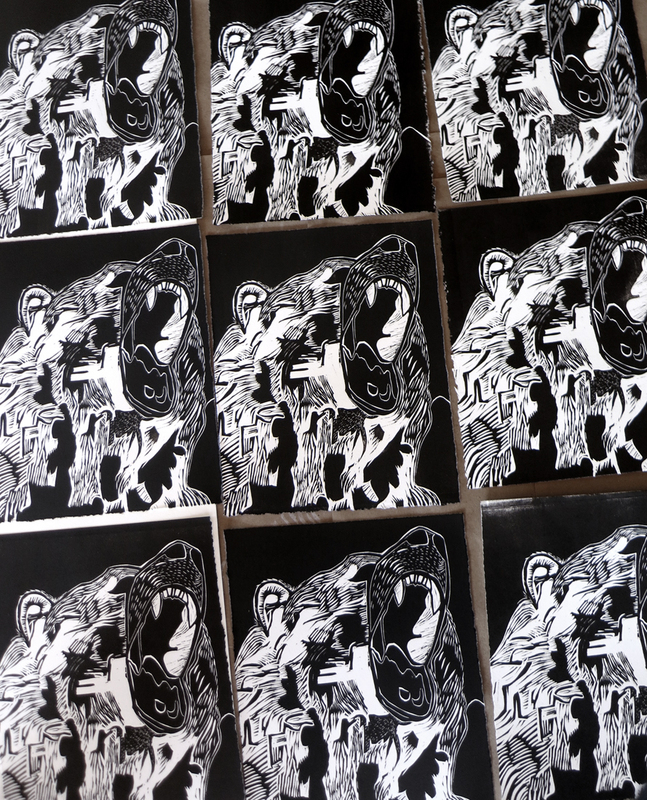 This is a great photo of all the prints drying. 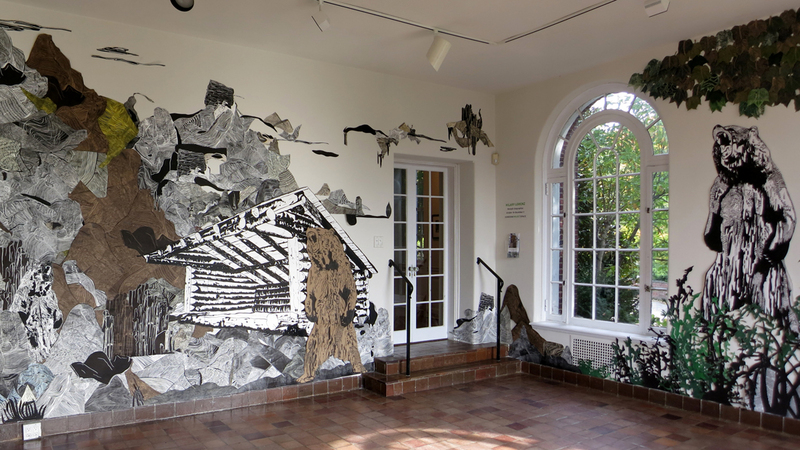 If you are not familiar with my show at Wave Hill in NY, it ran from October – December 2015, there are loads of photos on my blog, plus I added a couple here so you can see how the bear was incorporated into the printed and cut paper landscape. (Soon this work will be shown digitally in a gallery at the University of British Columbia, Vancouver, CA but that is another story. If you want a bear head, grab yours today for $20 on Etsy. 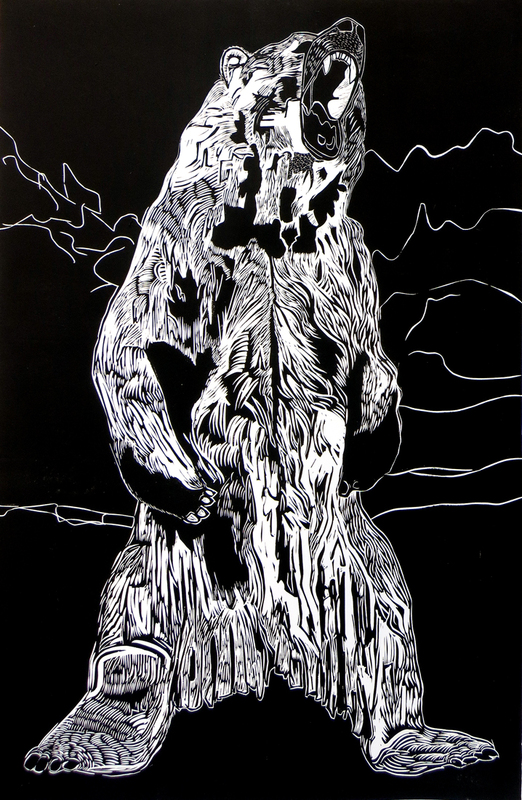 The bear portrait is fantastic but that large scale bear print is incredible and absolutely breath-taking. I cannot imagine producing something on that scale. Amazing. Laura, it was really fun to carve, tough to print since I max out my press, but it is one of my all time favorite prints!